Time for a little light relief on winenous I think. So here is a wine I was drinking yesterday that I thought was remarkably good, and even better value for money. Arribes DO follows the Spanish bank of the Duero as it runs South along the border with Portugal. I had just about heard of the Arribes region (as the subject of a documentary by Zev Robinson) but had no idea it was also a DO until I saw this bottle for sale. A quick google reveals there is also an Arribes national park, with some of the most stunningly spectacular river landscapes you can imagine. The grape is Rufete, which is mainly used in Portugal. You might know it better as Tinta Pinheira. No? Me neither. It was made by Bodegas Arribes del Duero, the local coop, who certainly seem to know what they are doing. Oh, and it’s 14.5% ABV, and was aged in barriques for 5 months. Beautiful medium intense ruby colour. Intense dark fruit on the nose, and aromatically spicy. The aromas were mirrored on palate, where there was also a good solid structure – good acidity, and quite strong tannins. Quite bracing. As the wine warmed up, maybe from 13 to 16ºC, I also got some smoky treacle notes, and a little bitter chocolate. Later in the evening, when probably a bit over 20ºC, the wine got a bit soupy and the alcohol and acidity seemed to dominate – something I find with most wines, so not really a criticism. Elegant and subtle it isn’t, but there is lot a going on in the wine, and it made an excellent accompaniment to robust food. I hope that does not sound like faint praise – it is not meant to be. It was sold to me as something to drink by 2016, but I say it is not going to die anytime soon. Would it improve? I really don’t know – it is pretty damned good now *****. Sadly out of stock now at The Daily Drinker where I bought mine, but Kudos them for finding it and selling me a bottle for excellent price of £9.00. Red Squirrel Wine are still offering it for sale at the same price, and maybe will have a few bottles left after I have placed my order for a case. Update: See also Arribes de Ventonia Redux – bottle variation? 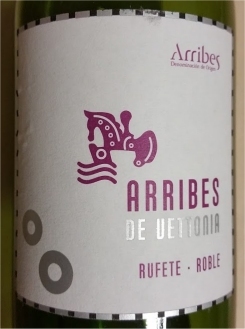 This entry was posted in My tasting notes and tagged arribes, rufete, spain. Bookmark the permalink.